Reading is a habit I work hard to encourage with my team. I spend a lot of money on it. Why? First, because books make me happy, I love our team, and when you find something that makes you happy the natural reaction is to share it with others. But there’s more to it than that. I believe it’s key to developing our team to be better tomorrow than they are today. Do you believe that statement? If true, then it means if I want the MWI team to be a better team, a world class team, they’ve got to read. Sure, they can get information in other ways by reading articles, blog posts, watching videos, looking at infographics, etc., but there’s something special about books. I’m writing my first one right now, and whereas I can easily crank out a blog post like this one, or even an article for Forbes, a book is more permanent. You’ve got to get it right. There’s no correcting it after the fact, like I can do with something online. So books tend to be better thought out, more cohesive, and represent better thinking. That’s not to say there aren’t plenty of poorly-written books out there, but if a book is poorly-written, whatever that author would write in a less permanent context would likely be even worse. Individual education/training. As an individual team member reads a good book, she learns things that improve her life and/or her ability to contribute to MWI’s clients. Pass-along education. If Michelle reads Scrum: The Art of Doing Twice the Work in Half the Time, and then she talks about it to other team members, then they are educated and their ability to contribute enhances even though they didn’t read the book. Group education. If multiple team members read the same book, they all gain individual skills, there is more pass-along education, and everyone will benefit more as a result. The whole ends up being more than the sum of the parts. Synergy. Team cohesiveness. If you watch a movie or listen to a song with someone else, this forms a connection, regardless of the content of the movie or music. Just the fact that both of you are sharing the experience creates a bond. Reading the same book, at the same time, is that experience taken to 1,000x. If you want your team to understand each other better and you feel like they could be on the same page more (pun intended), have your team read a book together. That’s not the full list of benefits, there are plenty more. New hire. When we hire someone on, I send them a pile of books. Sometimes literally, although we buy people books in print, Kindle, or Audible.com format according to their preference. Some of the books we give to everyone, no matter their role. Others are role specific. Change in role. If someone changes from one role to another (for example, from sales to account management) then I’ll get them the books that relate to account management, which they may not have had when they were focused on sales. Specific need. If I become aware of a certain need in the company, like an increased focus on culture, or a certain buyer persona, then that can trigger a book purchase. Awareness of a relevant book. The most common reason for a book purchase, however, is that I read a new book and realize someone else really needs to read it. Column A. The books on our list. There are currently 90 books on the list. No, I don’t put everything I read on the list, just the best books, the must-read books. For every book that goes on this list, I probably read 3 to 4 that don’t. Column C. Why read this book? I tag each book with keywords about why it’s worth reading, so if someone wants to see all the sales books MWI recommends, they can scan for that keyword. Other columns. I list each team member, their preferred reading format, whether they have a particular book, and then they check it off once they’ve read it. This way I can quickly and easily answer the question “Do you have such and such book and have you read it yet?” without having to ask all the time. Those books marked in red/pink are must-must-reads for everyone. 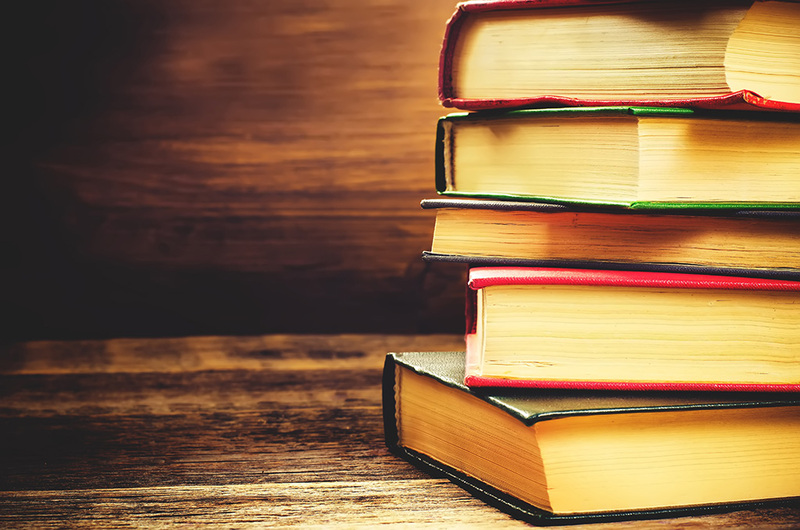 If you want to take reading a step further with your team, here’s an article I wrote for Entrepreneur on 6 ways to get more out of the business books you read. 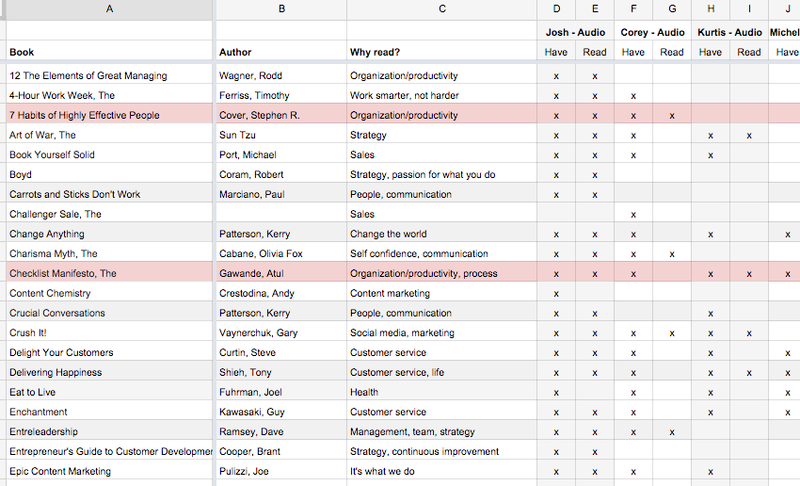 How do you and your team read books? What are some of your favorites? Let us know in the comments below.